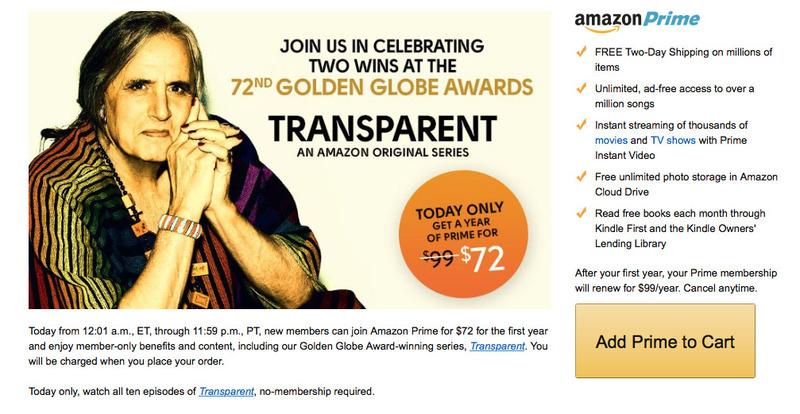 To celebrate Amazon’s two wins at the 72nd Golden Globe Awards for its original series, Transparent, the online retailer has dropped Amazon Prime memberships down to $72 for 24 hours only. The deal went live at 12:01AM ET and is good through 11:59PM Pacific, tonight. Amazon Prime memberships typically run $99 per year, so if for some reason you don’t already have a membership, now would be the time. Wait, you all do have Amazon Prime memberships, right? Don’t answer that if you don’t, just go sign-up. For those new to Amazon Prime, your benefits as a member include free 2-day shipping, unlimited ad-free access to over a million songs, instant streaming of popular movies and TV shows, free unlimited cloud photo storage, and a bunch of free books. It’s awesome, even if you just use it for the free 2-day shipping.